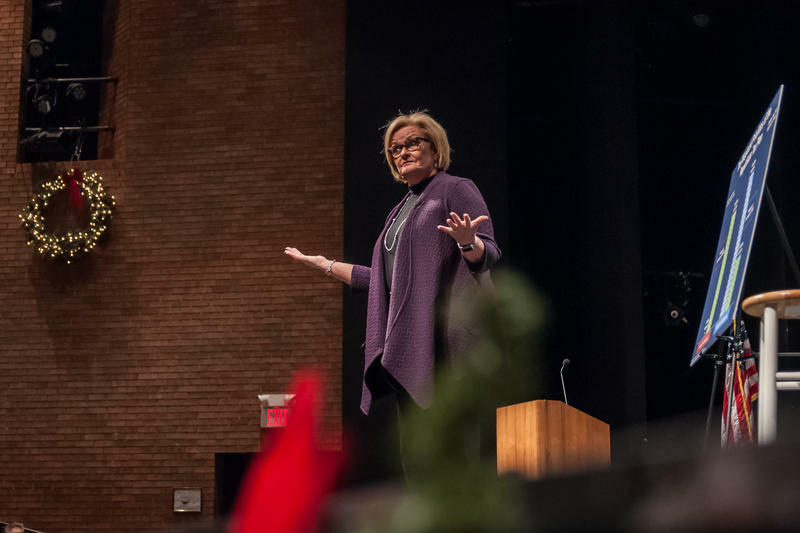 A few weeks ago, U.S. Sen. Claire McCaskill headlined a packed campaign event in St. Louis that attracted lots of supporters but few reporters. That episode reflected what had been the norm for months for many candidates running for office. McCaskill, a Democrat, noted that the public and the press have been almost exclusively focused on the troubles plaguing the state’s Republican governor, Eric Greitens. Her best-known Republican rival, Missouri Attorney General Josh Hawley, could have made the same complaint. But now Greitens is gone. And with a new governor comes fresh attention on McCaskill and Hawley, who are battling over a Senate seat that could determine which party controls that chamber next year. State and national Democrats are continuing to portray Hawley as being too soft on Greitens in the attorney general’s own investigations into the now-former governor. Hawley defends his actions. But he also contends that McCaskill and her allies are frantically trying to keep a dead issue alive, now that Greitens has stepped down. “After she and (Senate Minority Leader) Chuck Schumer spent over $3 million in TV advertising trying to politicize this crisis in state government – which was shameless, by the way – she now finds that issue has totally blown up in her face,” Hawley told reporters last week, shortly before Greitens officially resigned. There’s no question that Hawley and his staff remain involved in any post-resignation look into Greitens’ activities. For example: St. Louis Circuit Attorney Kim Gardner is still grappling with Greitens’ lawyers over a settlement agreement signed last week that played a role in Greitens’ departure from office. On Tuesday, Hawley told Gardner he supports the idea of making public an unredacted version of the deal that her staff struck with Greitens’ lawyers for him to resign. That is expected to be challenged by Greitens’ attorneys. Meanwhile, Democrats point to new reports that at least 20 members of Greitens staff used a special texting app that erases messages as soon as they are read. Critics say that violates the state’s open-records laws. The apparent widespread use of the app contrasts with Hawley’s report several months ago that far fewer aides used the app and state records were not likely at risk. Hawley’s biggest recent campaign boost has been his endorsement from the political arm of Missouri Right to Life, the state’s largest anti-abortion group. Hawley long has had the support of his party’s social conservatives, who were solidly behind him when he first ran for office two years ago. That popularity stems, in part, from his role as one of the lawyers in the Hobby Lobby case. The Supreme Court ruled that companies did not have to cover contraception in their insurance plans if it violated their religious beliefs. Susan Klein, executive director of Missouri Right to Life, cited that case when she explained at a news conference last week why her group was backing Hawley’s Senate bid. “Since getting into office, Josh has worked to enforce and defend Missouri’s common-sense pro-life laws that have been passed by our supermajorities in the House and Senate,” Klein said. McCaskill supports abortion rights and has particularly noted her support for access to contraception. She is opposing President Donald Trump’s effort to block any federal money from going to Planned Parenthood, which is the nation’s largest single provider of reproductive services, including birth control and abortion. 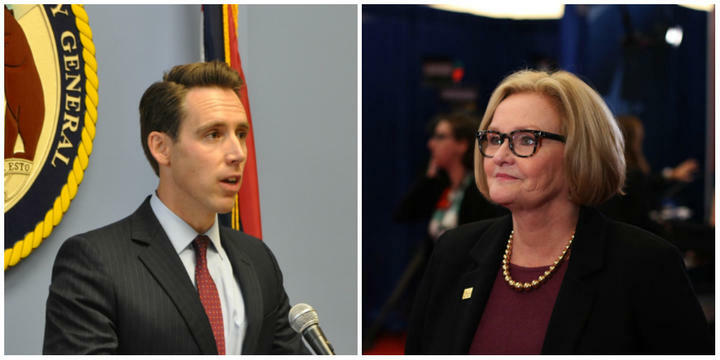 Hawley is stepping up his long-standing accusations that McCaskill is in lockstep with liberal national Democratic leaders and a roadblock for Trump. The president – who carried Missouri by almost 19 points in 2016 – is slated to make another visit soon to help Hawley raise money and his profile. Hawley especially needs the money, since McCaskill has heavily outraised him. Hawley also is benefiting from a new ad campaign launched by One Nation, an outside group with ties to U.S. Senate Majority leader Mitch McConnell. The TV ad doesn’t mention McCaskill, but promotes Hawley as a defender of the public’s personal privacy. McCaskill’s campaign is challenging his record on that issue, and her allied groups continue to attack Hawley on TV – in some cases attempting to tie him with Greitens. The senator’s own campaign ads are focusing on her image, by highlighting the 50 town halls she has held over the past year – many of them in rural parts of the state. McCaskill is currently doing a series of statewide events promoting her efforts to help veterans. But at a recent stop in Arnold, most of the public’s concerns centered on health care – one of the senator’s main campaign issues. She has pointedly asked Hawley where he stands on the issue, aside from his continued call for ending the Affordable Care Act, which also is sought by Trump. Such sparring fits in with what Republican U.S. Sen. Roy Blunt predicted weeks ago. Blunt acknowledged that Greitens’ troubles could hurt the GOP in the short term. Black drivers are more likely to be stopped by police than other groups in Missouri. That’s what a report from Attorney General Josh Hawley’s office shows from data collected in 2017. 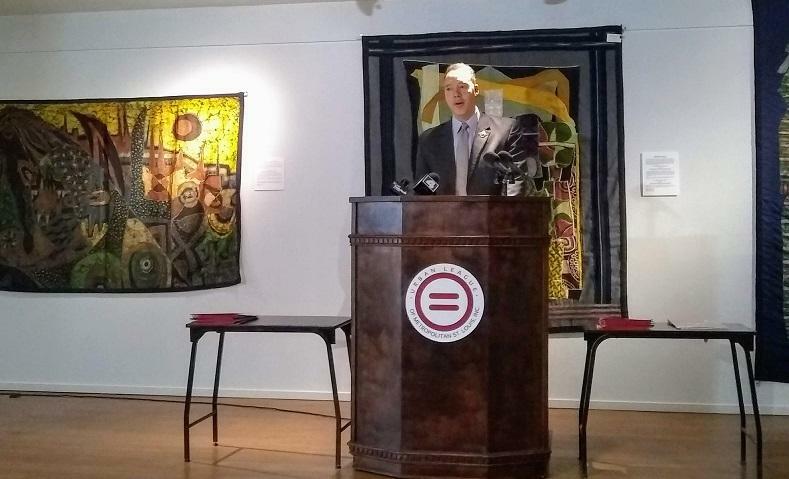 The annual Vehicle Stops Report shows black drivers were stopped at a rate of 85 percent higher than white drivers throughout the state. Black and Hispanic drivers were searched at higher rates than average as well. In cases of searches, white drivers were reportedly found with contraband more often. U.S. Sen. Claire McCaskill is back on television with a 60-second campaign ad that, like her earlier one, ignores her potential Republican opponents.